If you’re a Filipino born in the Philippines you must love salted duck eggs. (Hmm my stepson W, who hates anything yolk unless used as an ingredient, is an exception.) Be it main served with fresh tomatoes, a garnish on Pancit Malabon, or just a wee bit on your favorite ensaymada or mooncake – it’s something that gives your dish that extra oomph. 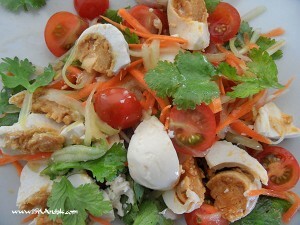 So when Trish’s challenge for Kulinarya Cooking Club is to use itlog na maalat (salted eggs) as an ingredient or a whole dish, I could only think of salted egg and tomato salad. But Erwin has this wonderful idea. Salted eggs usually come in a pack of 6 – why not use all for entrée and 2 mains? Not bad eh. I’ll come to that a bit later. Let me first describe the salad that I made. 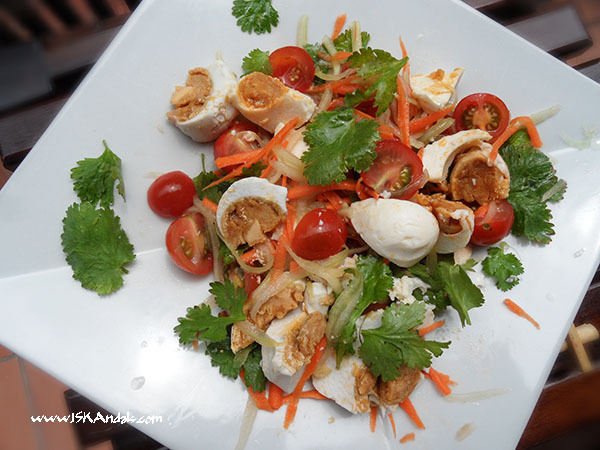 This is a quick one with fresh tomatoes, cucumber and carrots, with citrusy-sweet dressing – all tenderly tossed and slightly squeezed and when mixed with the salted egg wedges and coriander sprigs the flavors are quite fresh and delicate. I added a combination of paprika-infused olive oil and chili oil as I always make them but that’s optional. 2 tbsp of olive oil will do (or peanut oil). Hay naku I literally drank the leftover sauce! You may choose to add chopped chili or thin slices of raw onions (crunchy!). 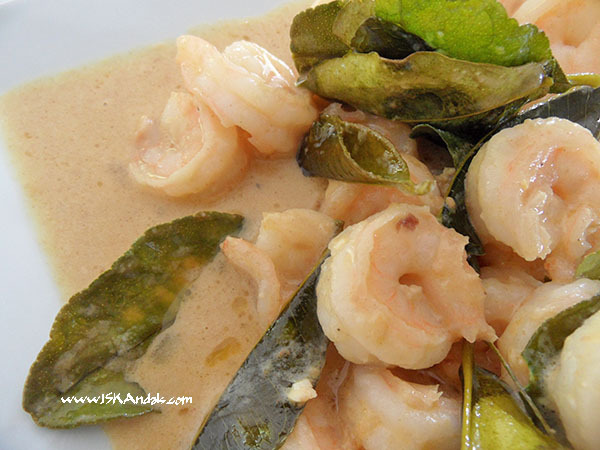 In a bowl, combine fish sauce, limejuice, sugar and olive oil. Set aside while you prepare the rest of the ingredients. 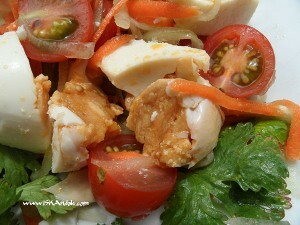 Combine half of the prepared dressing with tomatoes, cucumber and carrots in a serving plate. Use your fingers to toss and squeeze lightly. 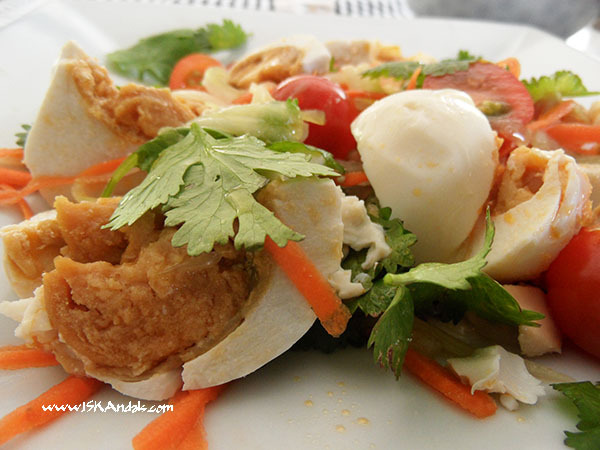 Arrange salted egg wedges on top and garnish with coriander sprigs. Drizzle with the remaining dressing. It would really be nice to have at least 1 salted egg yolk mashed and mixed with the dressing. YUM. For the main, I decided to make buttered prawns with salted egg sauce instead of the usual egg floss that always hit the spot. 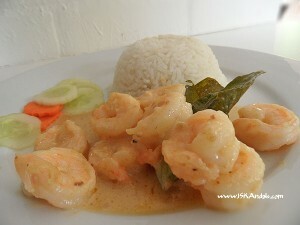 I must say the creamy sauce is to die for aside from the fact that the preparation is much easier than making egg floss. I love frying whole prawns until shells are transparent, tails are crunchy and heads crispy. Kinakain ko lahat walang tapon. But not all my boys are like me. So for this dish I bought headless prawns, peeled and deveined. 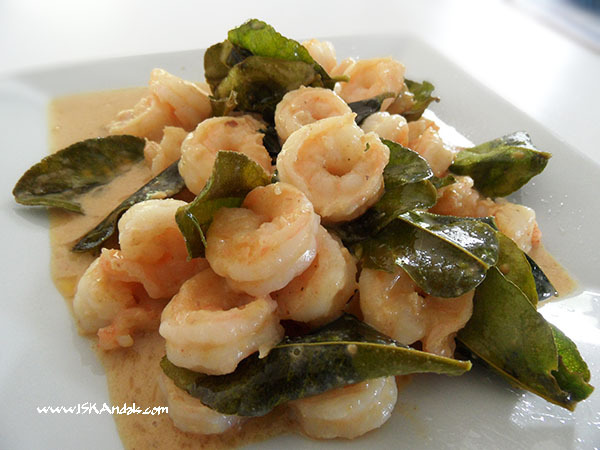 Too bad I couldn’t find curry leaves so I opted for lime leaves. The flavor divine but unlike curry leaves that can be fried until crisp, these aren’t edible no matter how long I try to fry them. 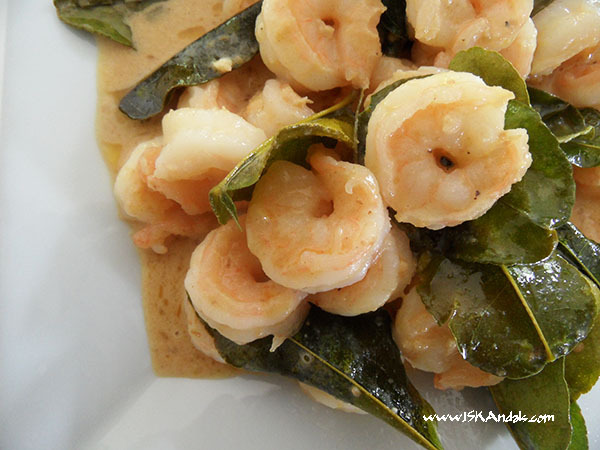 Dry prawns on paper towels. Season lightly with salt and freshly ground pepper. Set aside. Carefully separate the yolks from the whites and mash these on a small bowl. Set aside. Heat oil in a wok. 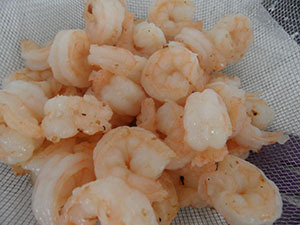 Deep-fry prawns in batches for a minute. Drain in a colander. 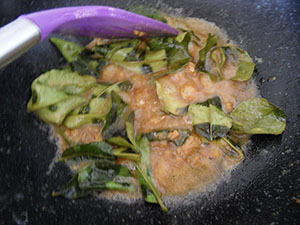 Remove oil from the wok but leave about 2 tbsp of oil to mix with butter. Heat until melted. 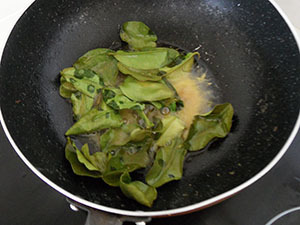 Add the lime leaves and cook until looking crisp and aromatic. Add the mashed yolks and cook for a minute or 2. Add fresh milk and sugar and cook over medium heat. Taste and season with a little bit of salt if you think necessary. 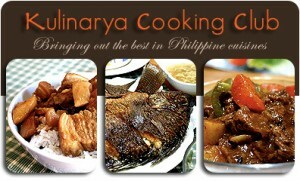 Kulinarya Cooking Club was started by a group of Filipino foodies living in Sydney who are passionate about the Filipino culture and its colourful cuisine. Also sharing with and . The salted egg serving is superb! Wow! I love itlog na maalat with kamatis!!! Yumyum! This looks delish! Will have to try this next time I buy some shrimp! I’ll bet the sauce will be good on top of my steamed tofu too. Great pics! Salted egg sauce on tofu sounds yum, Dee! oooh, looks reall tempting! nakakagutom..! same here, usually I eat all of the shrimps (walang tira, lol) specially when it’s crispy. you’re making me wish i have some fresh shrimps right now…lol. This made my mouth water, Iska! Kaloka! Salted Egg Salad at Shrimp with salted egg sauce! Parang ang sarap kumain ng naka-kamay! 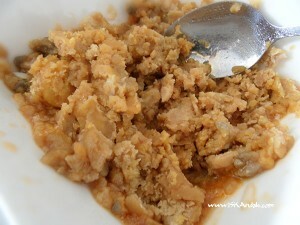 Peachy, I didn’t tell my stepson what’s in the sauce… ay ang sarap din ng kain nya eh haha! Your salted egg prawn dish really looks good. Haven’t tried cooking with this ingredient yet but will venture. Love salted eggs, the salad and the prawns look like real winners! 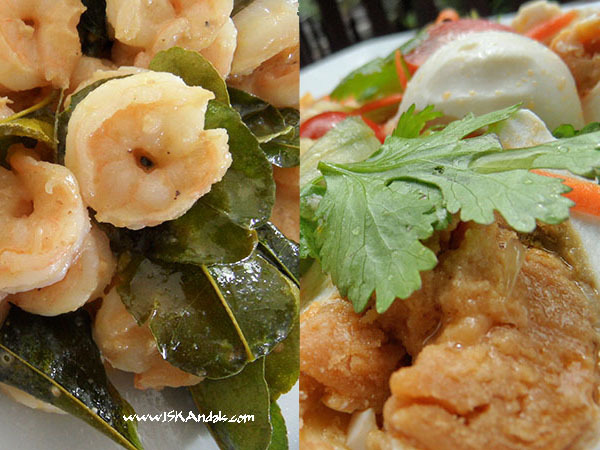 Both salad and buttered prawns look amazingly yummy! I sooo love your entries to this month’s challenge! i love your creativity! silly me wouldn’t have thought of making salted egg sauce! Both look really easy to make and very yummy indeed. I love the salad with the addition of vegetables. What awesome photos and such a mouthwatering salad. I can’t resist and feel like diving into the computer screen ! 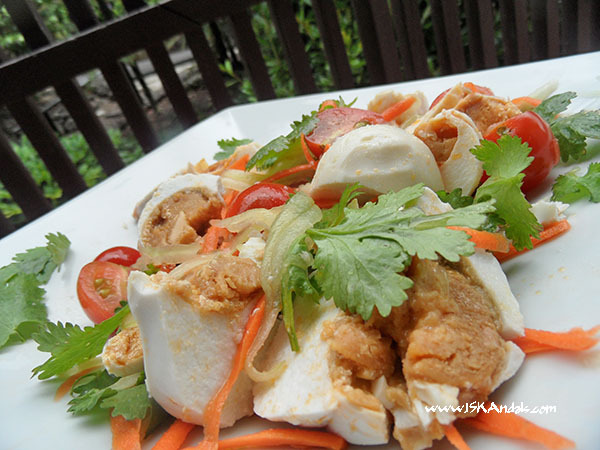 Thanks for sharing this delish recipe using the salted egg!